I must admit my skepticism prior to trying this dish. I was suspicious of squash noodles, or anything masquerading itself as a gluten item that in fact is not. As a woman living with Celiac disease I cut my loses with noodles a long time ago. Rice noodles were a sad disappointment. Quinoa was mediocre, bless the hearts of the individuals trying really hard to manufacture gluten free noodles…I know that they are trying. But I gave up. Until last week. My husband and I had a very rare and impromptu date night at our favorite little bistro style taphouse in Ashland. Out of curiosity I ordered a promised gluten free, vegan veggie spaghetti dish with a white wine sauce. The meal was truly extraordinary and this is exceptional, considering I have become somewhat of a harsh food critic. So my dear friends, I am proud to say that I have recreated an Amanda version of the dish with the help of a vegetable spiralizer and fresh vegetables from my garden, and the gardens of some wonderful friends. For folks with food allergies, this is a treat. It is gluten free, dairy free, vegan, grain free, and paleo. Initially I dreaded making this because I felt that it may be time consuming, but it was a much quicker dish that I thought. Furthermore, my gluten eating husband loved it, so a winner all the way around. 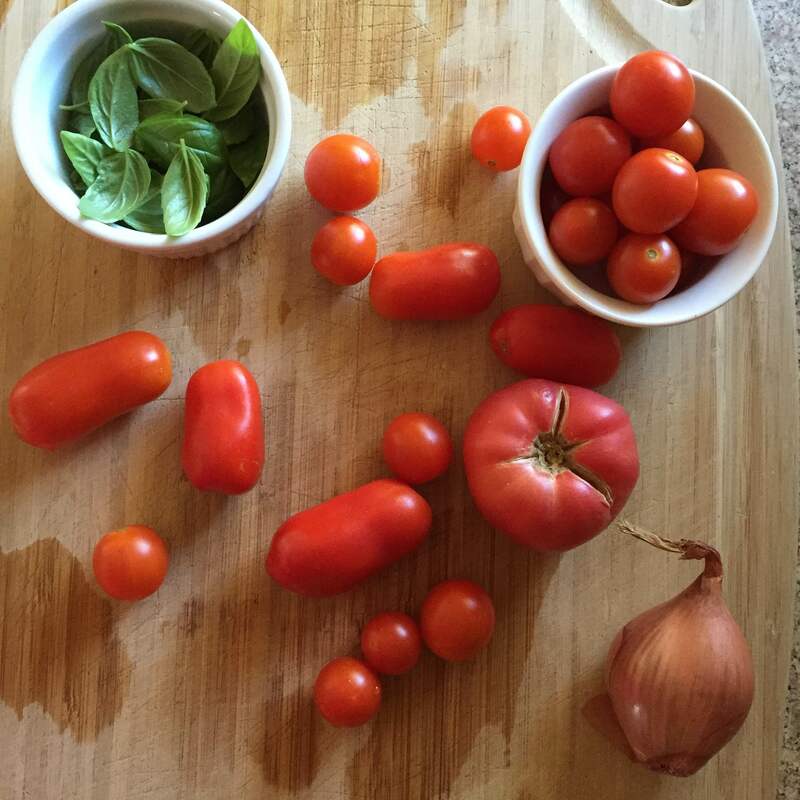 *I used a variety of tomato breeds for a wonderful flavor: roma, heirloom, and grape tomato. I was very pleased with the interesting slightly sweet flavor that this created in my sauce. **I used a Pinot grigio, others cooking wines are white blend, chardonnay, or pinot gris. The rules of cooking with wine is to use a wine that you wouldn’t mind drinking later- if you drink wine. This enhances the taste and leaves you something wonderful to drink instead of cooking with 1/2 cup and dumping the rest of a garbage wine. Waste not, want not, friends!!! In a large sauce pan, warm the olive oil on medium heat. Slice and de-seed the tomatoes. For added nutrients leave the skins on, and add them to the sauce pan once olive oil is warm. Add 1/3 cup of water and place a lid over the pan. Allow to simmer for 30 minutes. 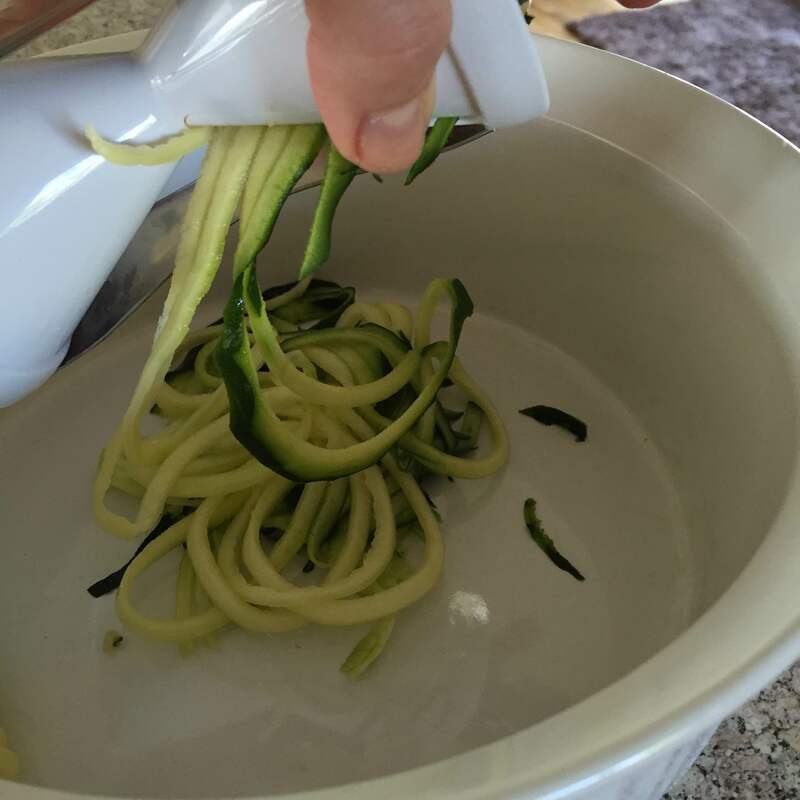 Meanwhile, utilize the vegetable spiralizer to make you squash noodles. 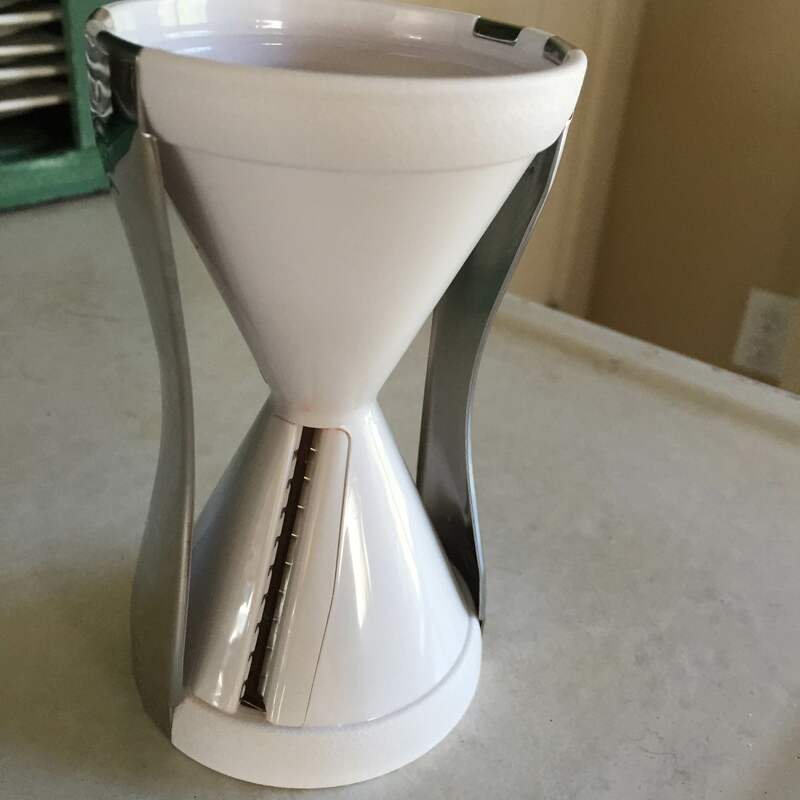 I love my Veggetti Spiral Vegetable Slicer, Makes Veggie Pasta . It is wonderfully easy to use. Then, add scallion, white wine, basil, garlic salt, and pepper to sauce pan containing tomatoes and reduce to low heat, stirring occasionally, allow to simmer on low for an additional 15-20 minutes. Fill a large pot with water and bring to a boil. Add squash noodles and allow to boil for 3 minutes. After 3 minutes remove, strain, and place into a heat safe ceramic bowl. Serve with sauce on board. 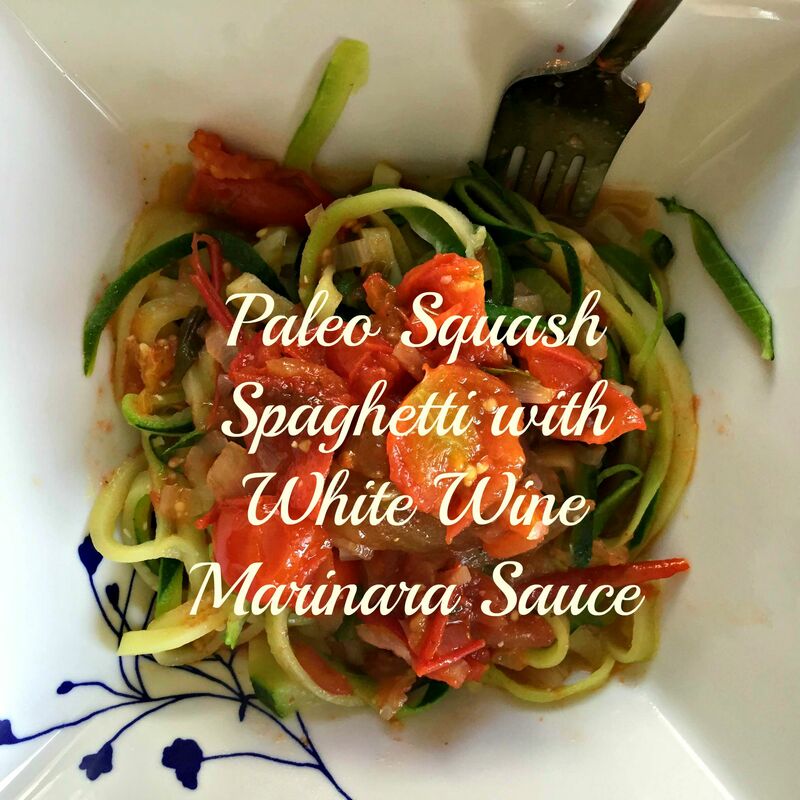 This entry was posted in Recipes and tagged Gluten free pasta, marinara sauce from scratch, paleo pasta, paleo recipes, Paleo squash spaghetti with white wine marinara sauce, squash pasta, Vegan dishes, vegan pasta, vegetable spiralizer, veggetti, veggie spiralizer, white wine sauce. Bookmark the permalink. 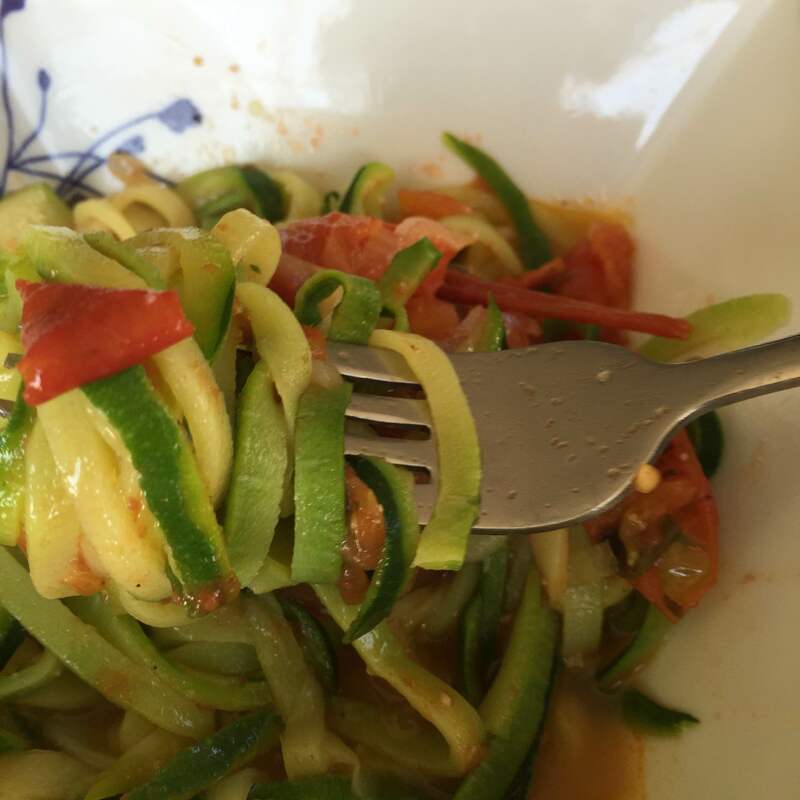 Do you weep the zoodles? I’ve found this a strange process and don’t really notice a difference. Excited for this new recipe to try! I’m unfamiliar with weeping the noodles! Andrea, give me a tutorial, what is this process!